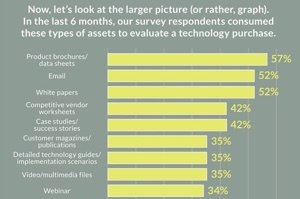 What is the best B2B content for tech buyers? Marketing professionals are constantly working to develop content to support the sales process and attract the best visitors to their website. When it comes to the Inbound Marketing Methodology, developing the best B2B content is crucial to attracting and nurturing prospects. In an earlier blog article, we exposed the fact that sales people spend only 1/3 of their time selling, and we learned that lack of content was the primary driver of this disappointing statistic. The focus of this article is to discuss the value of content types that impact B2B technology buyers the most and how to use them efficiently. This infographic from eccolo media shows the results of a survey of the content types that are most valued by B2B technology buyers. Let's drill into the survey data one by one and review the implications for Inbound Marketing. Click on any of these images from the infographic to see the entire infographic on Pinterest. 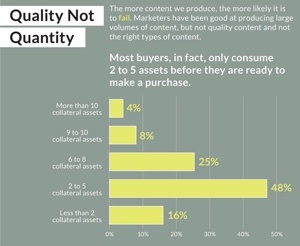 Most buyers consume 2 to 5 assets before they are ready to make a purchase. This statistic makes sense to me when I am researching solutions to my problems. The best-practice Inbound Marketing methodology requires content that provides at least one pass through the "Buyers Journey" to nurture buyers from one stage to the next. 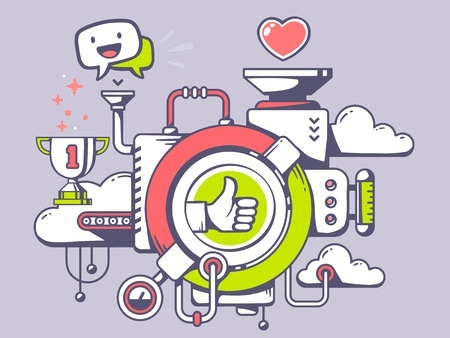 In this way, you are aligning content with the B2B sales process. What types of content assets should they be? Readers confirmed that they read the same amount of whitepapers and emails. The mix of both is good news because it demonstrates that a combination of whitepapers and emails are very effective at influencing B2B technology buyers. Furthermore, tech marketers can use email nurturing powered by marketing automation triggered by whitepaper downloads to drill into the details and educate the visitor on the topics they are researching when they found the whitepaper. After all, the white paper should be focused on addressing a research need for a problem and solution and the emails embellish the topic. Are traditional white papers dead? According to this research, certainly not! 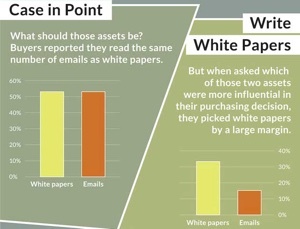 In fact, whitepapers have to two to one impact on influencing purchase decisions. Considering technology purchase decisions mostly are medium to high average cost to the buyer, there is likely more research performed to ensure the product or service will address the need. It is important to include white papers as educational content, but they should not be the sole content format used when marketing your company to buyers. Think about the thought process the customer will go through at each step in their process and optimize each content item for fast consumption. Content examples that balance the education of your solution are product brochures, data sheets, competitive analysis and most importantly customer success stories. Surprisingly, video content is eight on the list from the survey. I expect that if we were to drill in more detail regarding video, the difficulty of video SEO and developing the right titles that compel the visitor to view the video causes of this lower B2B technology influence. Check video views and CTA conversions to determine the performance of video on your website versus other media. Our recommendation for B2B technology businesses who need a roadmap of the best content to enable engagement by their buyers should establish a content strategy that aligns with their most efficient sales process and reinforces it. If interested, please download the Bristol Strategy content strategy data sheet. Each market segment lends itself to different types of media. The right approach to develop your content strategy is to understand your buyer and their preferences then take steps to build content that they want to consume. 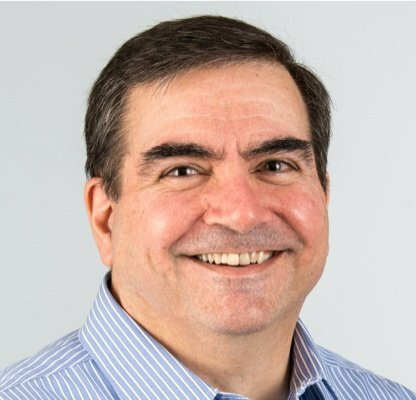 In this digital and mobile world, marketers should use analytics to determine what is working and what is not to fine-tune the digital engagement with their market. Get tips for how to establish Inbound Marketing Key Performance Indicators (KPIs) by reading this article. Reach out to Bristol Strategy if you require advice.